Luxury developer GURNER™ has revealed the first design details for the impending launch of Saint Moritz, its most ambitious and significant Australian project to-date that will see ultra-luxury living taken to a new global standard. The project boasts an end value of approx. 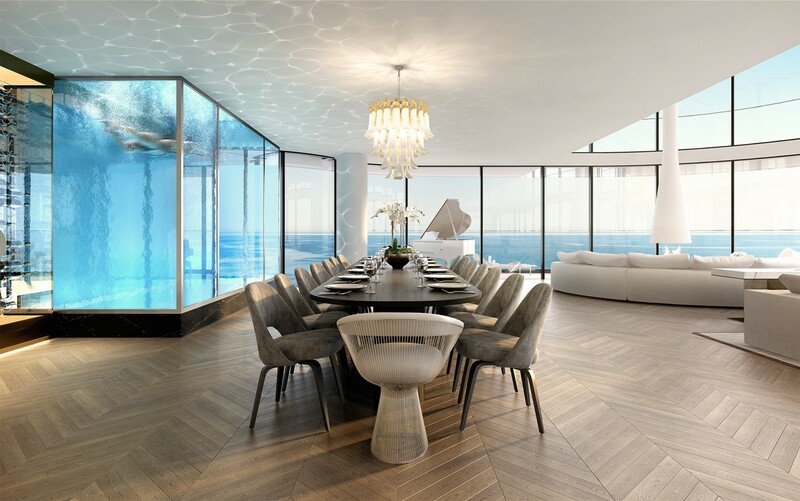 $550million spread between just 120 residences offering unparalleled beachfront luxury, along with over 5,000sqm of private amenity and a world-class hospitality venue anchoring the ground level. With the residences averaging price-points of around $3.5million, the project is gearing up to be the most ambitious luxury project launched in Australia at this level. The developer is currently amending the permit for the high-profile site at 14 – 16 The Esplanade, St Kilda, to effectively halve the number of apartments from 240 to just 120, and focus on the ultra-luxury end of the market which GURNER™ suggests has never been stronger. “ We believe the luxury end of the market has been waiting for something like this to come along, with significant depth and demand for the right project offering the right level of luxury,” GURNER™ founder and director, Tim Gurner said. GURNER™ has appointed Fender Katsalidis as lead architect, with Koichi Takada Architects appointed to design one of the three buildings and long-time collaborator, revered interior designer David Hicks to craft the interiors, while Jack Merlo has designed oasis-style landscapes throughout. The first of the three buildings, Pacific House, is set to launch to the public mid-year, and features 45 residences with an average price-point of $4m. The $30million penthouse that sits atop Pacific House will offer 650sqm of internal space along with a substantial 175sqm terrace with private pool, six bedrooms, a seven car private garage with direct access lift, four living rooms, in-home sauna and gym. 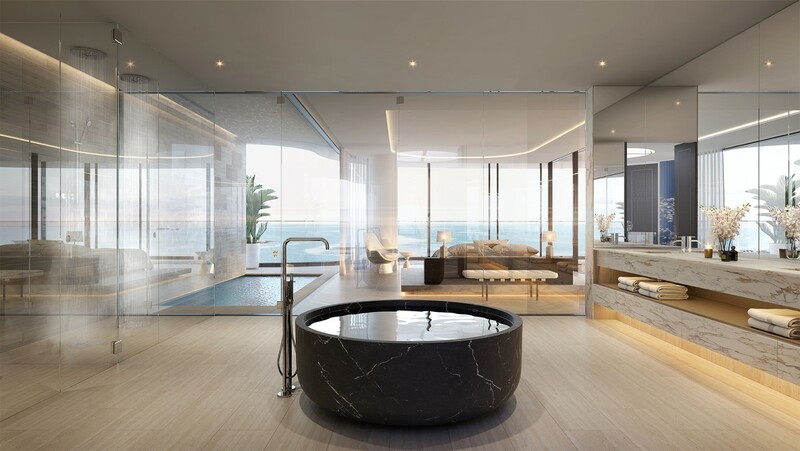 The double-storey penthouse has earnt its price-tag with gravity-defying design features such as a cascading two-storey water feature surrounded by marble-clad walls, a solid Nero Marquina bathtub with 180 degree water views, another internal pool that submerges into the rooms below - complete with transparent glass that can be viewed from the lower level - a floating fireplace and a 1000-bottle, temperature-controlled wine cellar, accessible via a sculptural spiral staircase. If sold, the penthouse will smash the record for Melbourne’s most expensive off-the-plan apartment, a feat that Tim Gurner is confident they will achieve. “ This penthouse has been designed to be the best in Australia and arguably one of the best in the world,” said Gurner. “ We initially designed the penthouse with a floorplan of over 1,300sqm and an even bigger price-tag however the early feedback we have received from our local and international clientele was that a penthouse of this size would be too big even for them,” he said. The residences are complemented by over 5,000sqm of private amenities staffed by professionals handpicked by Tim Gurner who pride themselves on providing highly personalised, discreet and reliable service to each resident.
" We want our buyers to feel like every day is a holiday as they are spoilt in ultimate luxury by the precinct’s loyal staff and are surrounded by a setting that rivals the best hotel and resort experiences in the world,” Gurner said. GURNER™ has earnt a reputation in recent years for creating custom homes designed to the taste of each discerning buyer. Here at Saint Moritz, GURNER™ has taken it to a whole new level offering the majority of residences a full design customisation package included within the purchase price. This service will allow purchasers to work directly with David Hicks and Tim Gurner to create interior spaces that are only limited by one’s imagination – bowling alleys, infra-red sauna and steam-rooms, cigar rooms, poker rooms, art galleries or perhaps even sound-proofed home offices or recording studios – “literally anything is possible at Saint Moritz” said Gurner. “ Our vision for Saint Moritz was to reimagine luxury living in Australia, looking to the world’s most iconic luxury waterfront developments to create something that will never be repeated again,” said Gurner. “ This is without a doubt the most ambitious and luxurious development we have ever created and I will ensure personally that every miniscule detail of this project is delivered to far exceed expectations,” said Gurner. Saint Moritz will offer 120 private residences encompassing two, three bedroom, four, five and six bedroom offerings, along with the six-bedroom penthouse, with prices ranging from $1.4million to $30million-plus. The project is currently taking registrations of interest with sales to launch in mid 2019. Saint Moritz has been imagined as a place where exceptional luxury comes naturally. The experience starts on arrival where residents and guests are greeted by a pure cantilevered glass cube that rises from the water below. Here, a striking spiral terrazzo staircase provides discreet access to the lobby and private access lifts below. Arrival by car feels like stepping into one of the world’s best hotels, with a 5.5m high porte cochere with personal valet and concierge to greet you on arrival and help you with your shopping inside. Once inside, the lobby doubles as a private sanctuary for those who inhabit it, complete with a private lounge area, bar and extensive 3,000-bottle wine cellar featuring some of Australia’s most important and coveted wines, curated by Saint Moritz’s in-house wine director, Rocco Esposito. Inside each residence, David Hicks has ensured the interiors boast the highest level of luxury home living with features never seen before in Australia. Many of the residences have direct access lift from their own car parks in the basement straight into their own private lobby. From here, the interiors lead to the ‘Great Rooms’ that are huge, opulent living rooms framed by wrap-around floor-to-ceiling glass windows to maximise the water and city views. No expense has been spared on the expansive interiors which include large amounts of Calacatta Gold, Carrara or Nero Marquina marble hand selected and imported from Europe, complemented by timber parquetry floorboards and coffered ceilings. 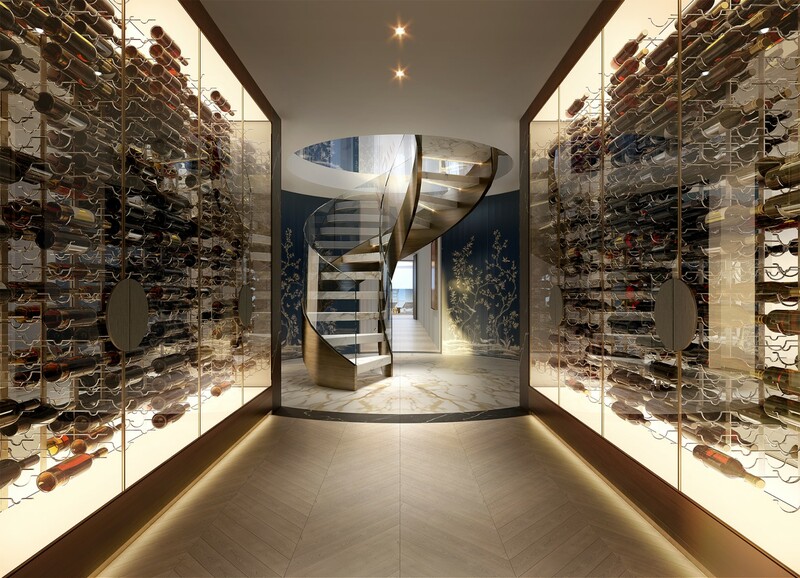 Residences also feature personal secure storage lockers and wine cellars, with space for parcels, shopping and laundry to be delivered by the concierge throughout the day, as well as a fridge for fresh food deliveries. Outside, expansive terraces maximise the sparkling bay views, and cater for an option to include a private terrace pool and adjoining steam room. “ Our buyers are conservative and discrete; they want to live in a building that sits quietly in its enviable position and provides the outmost privacy and security at all times, while being at the absolute highest level of design detail globally,” said Gurner. “ Karl Fender describes the design as ‘invisible design’ - a timeless masterpiece, with curves inspired by the sand and waves of the bay that will stand the test of time,” he said.